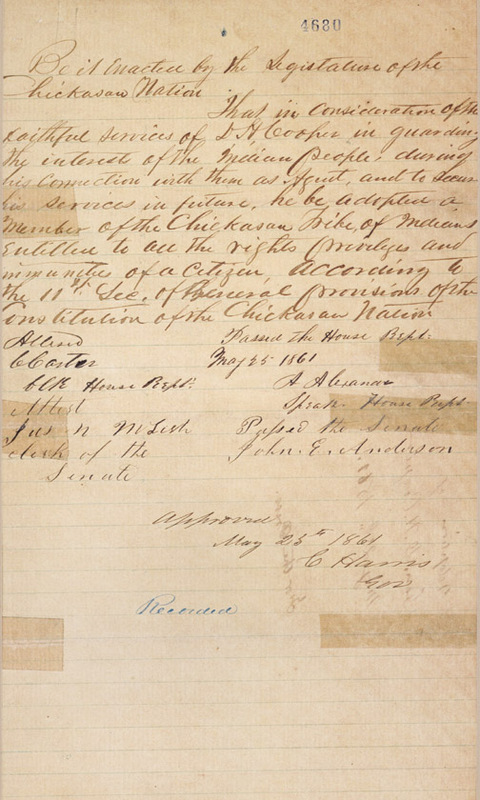 University of Virginia Library Online Exhibits | Photocopy of autograph document, "Enactment by the Legislature for the Chickasaw Nation" adopting Cooper as a member of the Chickasaw tribe. 1861 May 25. From the collections at the Oklahoma Historical Society, Oklahoma City, Oklahoma. Photocopy of autograph document, "Enactment by the Legislature for the Chickasaw Nation" adopting Cooper as a member of the Chickasaw tribe. 1861 May 25. From the collections at the Oklahoma Historical Society, Oklahoma City, Oklahoma. 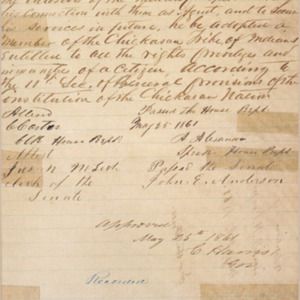 “Photocopy of autograph document, "Enactment by the Legislature for the Chickasaw Nation" adopting Cooper as a member of the Chickasaw tribe. 1861 May 25. From the collections at the Oklahoma Historical Society, Oklahoma City, Oklahoma. ,” University of Virginia Library Online Exhibits, accessed April 24, 2019, https://explore.lib.virginia.edu/items/show/2234.